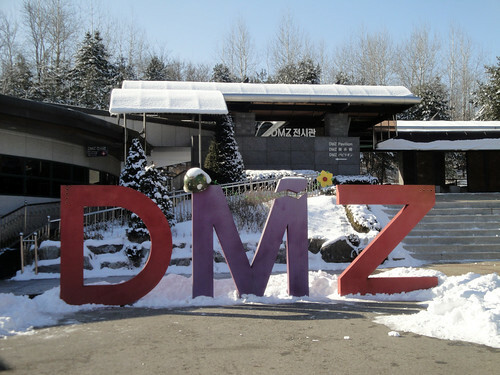 Living in South Korea for a year, it was necessary to pay a visit to the DMZ (that’s te DeMatiliarized Zone that separates the North and South, for anyone not in the know). And so I booked a tour with the US Army, which according to rumors did the best tours. Our day started bright and early at 7am at the army’s Itaewon outpost. 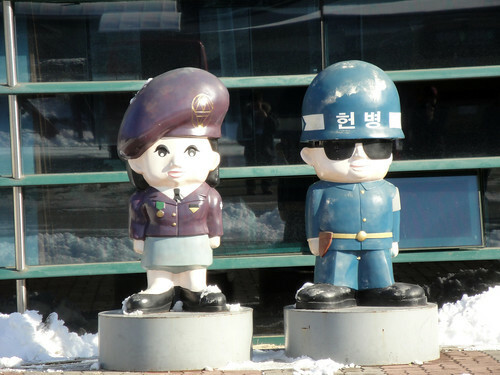 We joined the groggy tourists and boarded a couple of buses o take us on the hour trip north to the DMZ. The crowd seemed to be primarily American tourists, with many military or military families (they get to do the tour for free – for everyone else it’s 70,000ish won). I was quite surprised to see so many Americans, as I thought they may be too afraid to get so close to the scary North (like some Americans I know). 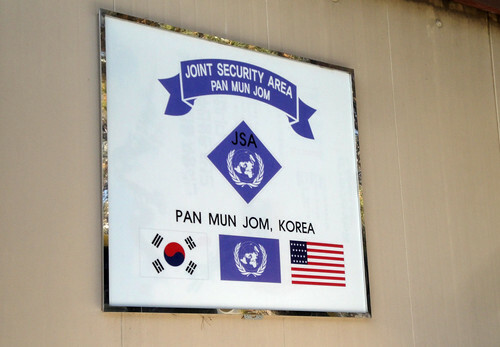 The tour started at the “Joint Security Area,” a section of the DMZ controlled by the American and South Kroean militaries. 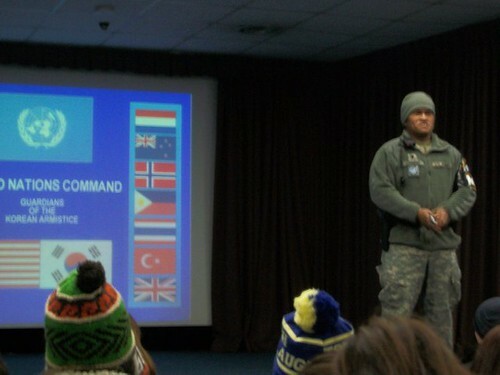 They started us out with a briefing, in which this very stern-faced military guy showed us a powerpoint that explained a bit about the US army’s role in ‘maintaining’ the DMZ, what we’d be seeing on our tour, and told us about a terrible attack from the North a few years ago. We also had to sign something like a waiver, that said we wouldn’t talk or make gestures at any of the North Korean soldiers. And wouldn’t sue the military if we were shot, etc. 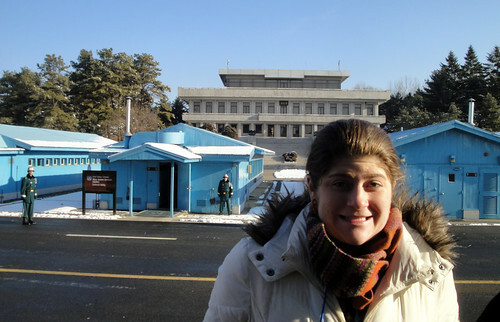 That bigger building in the back is on North Korean soil. There’s a soldier standing guard at the entrance, and our guide explained that he was always there when the tours came through, sometimes with binoculars. 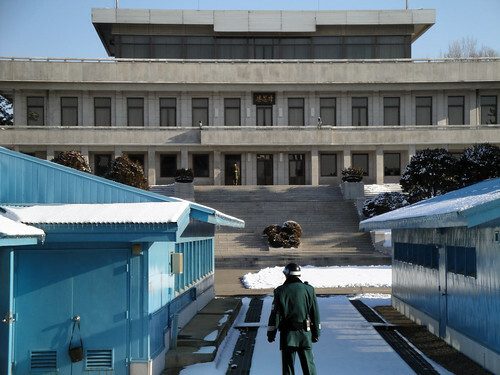 As we stood taking pictures, our American military guide pointed out all of the hidden North Korean soldiers that were (supposedly) watching us at that very moment. He told us to be sure not to make any gestures towards these (invisible) soldiers, as they would very possibly retaliate. We were taken into one of the meeting rooms, which was very unspectacular on the inside with just a boardroom table and chairs. 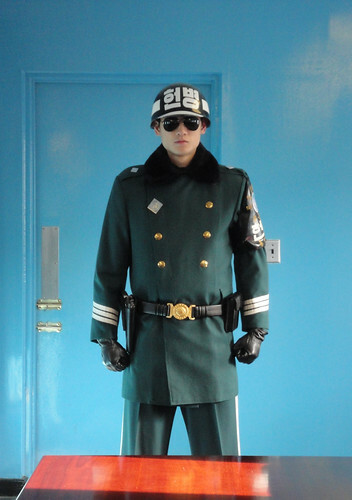 A couple of South Korean military had to accompany us. One had to stand in front of the door on the other side of the room, which lead to the North. Our American military guide sternly instructed us that if anyone tried to go behind the soldier, he was under order to use whatever physical force was necessary to make sure we didn’t get through the door. Crossing over to the other side of the meeting room, I technically entered North Korea! NOur guide was sure to let us know where the dividing point was. I think it would be interesting to get the tour from the North’s perspective, which I hear you can do if you tour the North. Not that I’m going to be doing that as an American any time soon. The giant structure awkwardly looming above the rest of the village is a ginormous North Korean flag. A bit of a battle went on between the North and South about who would have the bigger flag in these two villages, spurred by the South getting a new flag that was supposedly a bit bigger than their old one. After the North constructed this monstrosity, the South kind of let it go. That flag is 595 pounds, stands 525 feet tall, and is the second tallest flag in the world. When I was younger, I used to watch this video all of the time of Dr. Seuss’ the Butter Battle Book. It was written about the Cold War, but I think it applies even better to the North/South situation at the DMZ. The Butter Battle Book is about a town divided into two irreconcilable camps: those who spread their bread with the butter side up and those who spread their bread with the butter side down (the way that latter method works for anyone has plagued me since I was 7). But anyways, they go to war. One side builds a weapon, and the next side tries to outdo them, and so and so on into giant Suess-icle proportions. I forget how it ends, but I do believe they come to some kind of an agreement and refrain from blowing each other up. We left the “Joint Security Area” through the gift shop, which sold all kinds of DMZ t-shirts, postcards, and the other expected things. From the JSA we were taken to a sort of tourist center of the DMZ, which was done up quite cute. Here we watched a video, displayed across three gigantic screens, about all of the tunnels South Korean military has caught the North trying to dig into the South. The North claims they’re just mining, but they all seem to be leading directly towards Seoul. One of them has been turned into a museum, and so got to put on some hard hats and head underground to check it out. 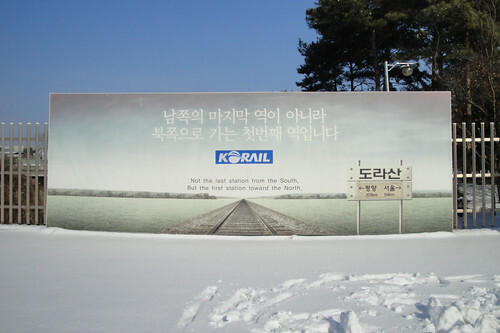 The last stop on the tour was Dorasan Station, built to connect the North and South by train. As of today, trains only run north to Drasan, although the tracks lead further north. 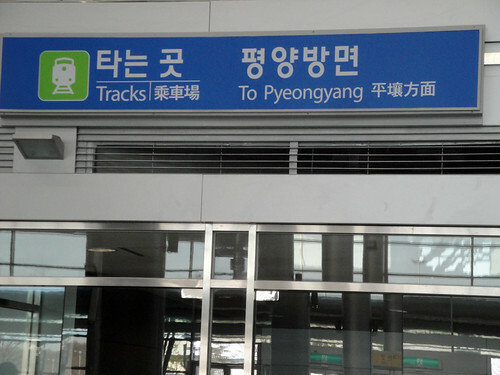 The sign at Dorasan Station. 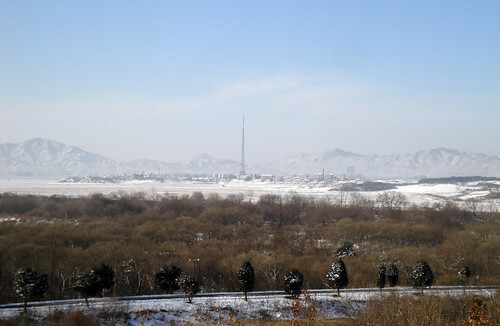 Pyongyang side non-operational, obviously. Not many people talk about the situation down here in Ulsan, as it’s pretty far away. But the last thing I read about reunification of the North and South said that it would cost 2.9 trillion US dollars to do, which is a bit disheartening.